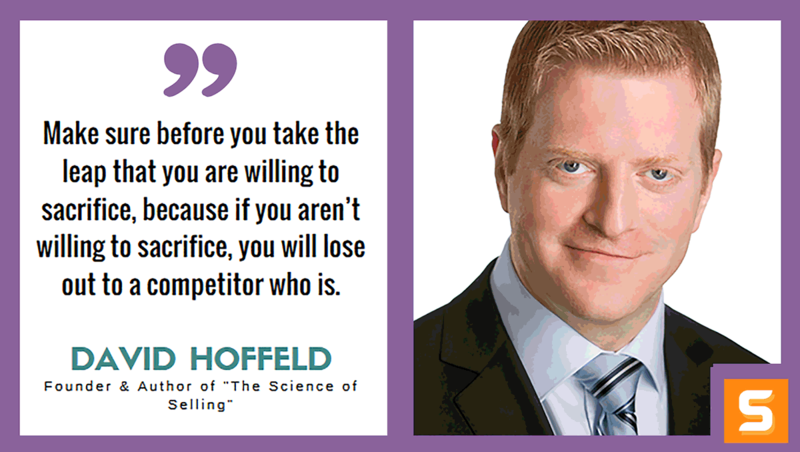 Author Interview: David Hoffeld "The Science of Selling"
David Hoffeld is the CEO and chief sales trainer at Hoffeld Group, one of the nation’s top research-based sales and consulting firms. He’s also the author of the upcoming book 'The Science of Selling', published by Penguin Random House. A sought-after sales thought leader and speaker, David has trained and coached salespeople from small and medium businesses to Fortune 500 companies. He’s been featured on Fortune, Fast Company, U.S. News and World Report, Harvard Business Review, The Wall Street Journal, CBS Radio, Fox News Radio, and more. In this interview with Startup Savant, David tells us his new book at pre-launched and what "The Science of Selling" is about. This book was inspired by salespeople and entrepreneurs, whom he wanted to help and improve at selling. This book reveals the strong connection between science, neuro-science and how the brain works to make a buying decision. To learn more about his work, visit HoffeldGroup.com or pre-order his book on Amazon. The Science of Selling blends cutting-edge research in social psychology, neuroscience, and behavioral economics with selling. It shows salespeople how to align the way they sell with how our brains naturally form buying decisions, dramatically increasing their ability to earn more sales. The book also reveals an evidence-based approach that connects the dots between science and situations salespeople face every day to help them consistently succeed. Who or what inspires you to write “The Science of Selling”? Research shows that the top factor in a buying decision is not the product or service, but how that product or service is communicated by the salesperson. Yet, research also shows that 63% of the behaviors salespeople engage in drive down the likelihood of the sale. This is why I wrote the book. In fact, it took me nearly a decade studying numerous scientific disciplines to understand the science of how the brain makes a buying decision. It was on this research that I developed my science-backed sales approach. Because it is based on how the brain is influenced and makes a buying decision, it eliminates the guess work around selling and it allows you to behave in ways that will guide your potential customers in taking what you say seriously and acting on it. How can “The Science of Selling” help salespeople, entrepreneurs and startups? The Science of Selling shows salespeople, entrepreneurs and startups how to present a product or service in a way that is aligned with how our brains making buying decisions. Most likely you already have a great product or service. The Science of Selling will help you convincingly tell the world about it. Can you share with us some interesting parts of this book that could help us close the deal with clients or customers? The book is packed with many examples, but one powerful, science-based insight is that our brains can only process a small amount of information at a given time. Once this mental threshold is surpassed, people are unable to make a confident decision. So, I would encourage you to consider what information you share in your sales presentations. Think through what your customers need to know to be able to confidently make a positive buying decision. Anything more than that—cut. When salespeople and business leaders adopt this simple strategy their sales go up because they are no longer overwhelming people will too much info. What are the advantages of using revolutionary sales approach? What makes it different from the ordinary approach? Most sales approaches are based on the premise that the founder of the sales method studied how great sales people sell. Though there are numerous flaws with this, the biggest is that it is forgetting the most important people in the sale – your potential customers. Our sales approach is radically different. We study how the brain is wired to be influenced and make a buying decision and then we base our sales strategies on that. We don’t develop a way of selling and then force our customers to confirm to it. Instead, our focus is always on the customer. My days consist of working with salespeople, sales leaders and business leaders and conducting research on the latest findings in sales, business, behavioral science and neuroscience. Also, a large part of time is invested in training and coaching salespeople on how to improve their sales results by basing their sales behaviors and strategies on science. What does your day-in, day-out look like as founder and author? When I get up in the morning, I begin my day by reading and checking email. If I’m conducting training or at an event, I review my content quickly so it is fresh in my mind. I always have my day planned out and have a list of things that I need to accomplish. So I’ll review those and mentally prepare of the day. Then I’ll either write an article, be interviewed, conduct a webinar, film a sales training video, consult for a client or train a sales team for most of the day. Then in the evening, after my kids go to bed, I’ll spend another few hours writing, reading or preparing for an upcoming presentation. In all, I work around 70 hours a week. When I got my book deal that included a large advance from Penguin Random House, I got emotional, which is unlike me. I remembering looking at my wife and saying “that was hard.” What I meant was that the journey to get to that point had a lot of ups and downs, but mostly it was hard work and refusing to give up in spite of the obstacles. That day was one I will never forget. I used to think that the more successful I became the fewer problems my business would have. I’ve since realized that it is the opposite. The problems never stop, but as your level of success grows, they change and you are presented with new problems that you will need to guide your business in overcoming. The way you fix problems is to first understand the problem and what is causing it, find a solution and then implement it. This process involves one thing: persistence. There are easier ways to make a living than owning a business, but I don’t care about easy, I want fulfilling and meaningful. Study the industry you want to enter, read books on starting a business, find a similar business and get a job there, or shadow a successful business owner. I was Vice President of Sales for a successful training firm for over two years, before I began my own. So when I launched my firm, I already knew how to structure and run a training organization. The key is to learn and understand the business inside and out so you can avoid common mistakes. Also, realize that starting a business is hard work and success will take longer than you think. I’d also strongly recommended talking to your partner about the sacrifice involved with starting a business. In other words, starting a business is about sacrifice. How much are you willing to give up to have a successful business? Make no mistake, there is a cost to success. If it was easy to achieve more people would have it. Make sure before you take the leap that you are willing to sacrifice, because if you aren’t willing to sacrifice, you will lose out to a competitor who is.